Water Sha From Drain Water? Feng Shui has been always associated with Water and no doubt it is. Shui 水 in Chinese literally mean water. Water can affect us since it is a vital Qi carrier and activator. In Feng Shui, water is usually associated with wealth of a house. Hence most feng shui master uses water features to help clients activate wealth in the house. At the same time, I have also meet cases where water features who was supposed to bring wealth to the family, brough accidents and loss of wealth at a very fast rate too. Thus when water moves, it creates Qi that could either prosper or destroy a house. The question is how does one knows if the water will do good or bad? It all lies in the skill of the feng shui master if he could make the Golden Dragon move or not. If the Dragon can move then the house will be wealthy and rich. On the other hand if the dragon does not move or moves in the wrong direction, then disaster spells. In modern days, we hardly see rivers in the urban areas but rather they have been replaced by drains. Drains being man made travel rather in straight manner compared to rivers which are made by Mother Nature, moves in a more curvy manner and thus the water flow is more meandering compared to drains. Modern non lineage masters call this cutting feet sha especially when it is big and moves fast. So when they see some drains flowing fast across the house they will usually conclude this as Cutting Feet Sha. This is an undesirable sha. Another definition that makes drain water bad is because drain is usually associated to being dirty or filthy or smelly and dirty water is an undesirable feature mentioned in classics. Thus dirty or smelly water is termed as Sha or killing Qi. The two above reasons are gross misrepresentation of water because the classics say clean, clear and meandering water is good. Classics are seldom written in direct manner. They usually have meanings hidden within words. Chinese language is unique in the sense a word or character can usually mean a few things depending on the sentence. So what does clean and clear really mean in classics? To understand it you have to know the entire classics because they are all inter related. 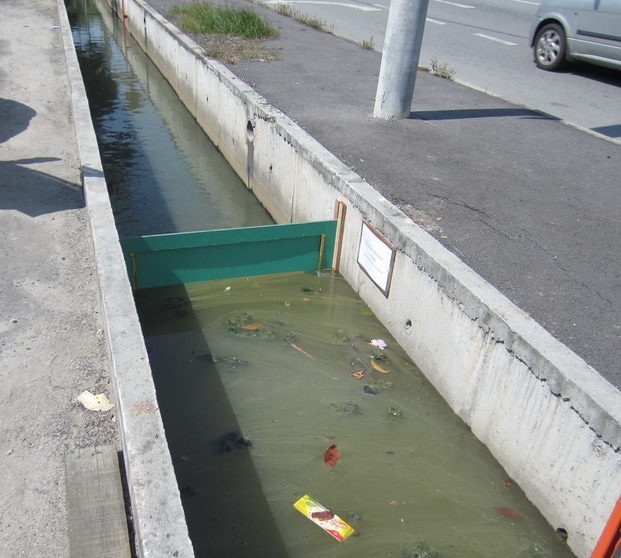 Drains cannot be termed as sha or bad feature but rather be treated just like any other body of moving waters. If you dont believe me, you will see there are business located in the vicinity of a river can prosper very well until changes happen to the river. It could be the river has been diverted or new in coming waters or other new outlets being dug. City rivers are seldom clean and clear. Thus the classics of Qing Nang Ao Yi written by the great grandmaster of Feng Shui Yang Yun Sung has clearly mentioned that the results depends on the capability of the master to turn the inauspicious to auspicious. Of course this has to happen within the context of landform allowable. To a lineage master, without measurement from the luopan, one cannot conclude the water is bad bercause the water is not bad, it is just water per se. It is the wrong setting of the house that turns this water to bad waters. How much can the master turn it from bad to good will depend on many factors but the main factor being how extensive can the property be reorganised. This, to many clients is not a pleasant news at all because it involves money and time. Every thing great requires considerable effort from the person itself and Feng Shui is no exception. The only difference is the fruits you will get for the effort you put in. I would like to take this opportunity to wish you a Merry Christmas and Happy 2015.